In this class, written transcripts of everything I've said in each video is available to read so you can be sure to fully understand what I'm teaching at your own pace. Also available are critiques of student projects I've written to learn even more from. Making mistakes are a major part of getting better at your art, and learning from the critiques of other students is a key component of improving yourself. Give this class a shot, we're all a very open, constructive, and passionate group about advancing your art and perspective drawing! This class aims to teach everything you need to know about the fundamental skill of drawing perspective in order to give your art a sense of place and setting. Understanding perspective brings a grounded reality to your art and transforms the way your audience interacts with it. It is key in taking your work to the next level, and advancing your skill in illustration. I personally look at perspective differently than other artists. Over the years of my career as a professional illustrator, I've learned how to think about perspective differently in order to better fundamentally understand how it applies to the real world around you. This class is NOT the way you've seen perspective explained a thousand times before -- you all know the typical boring example of a road going straight into the distance with a row of power lines to the side? This class forgoes those dated models in favor of teaching actual mechanics of how and why perspective exists. 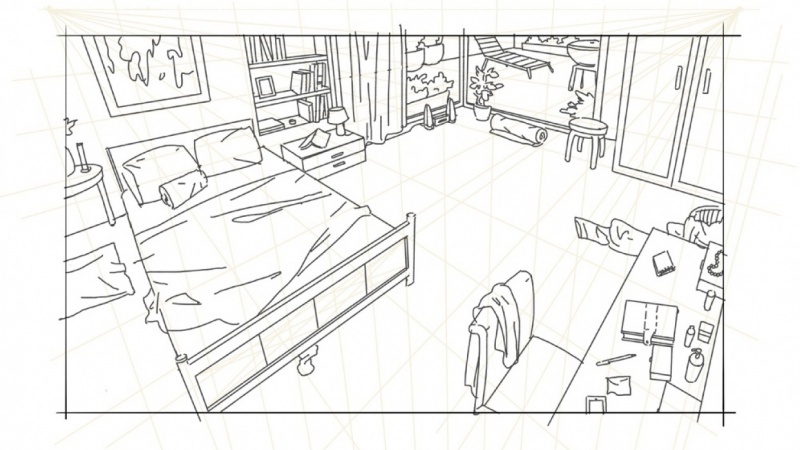 Some of the core concepts will still be here, such as one, two and three point perspective, of course. But it's how I teach you to think about them that will forever alter the way you draw environments. Above: some examples of my past work. Perspective is broken down into key points. We will begin with concepts and terminology, including covering the various drawing techniques, and populating your scene with details. 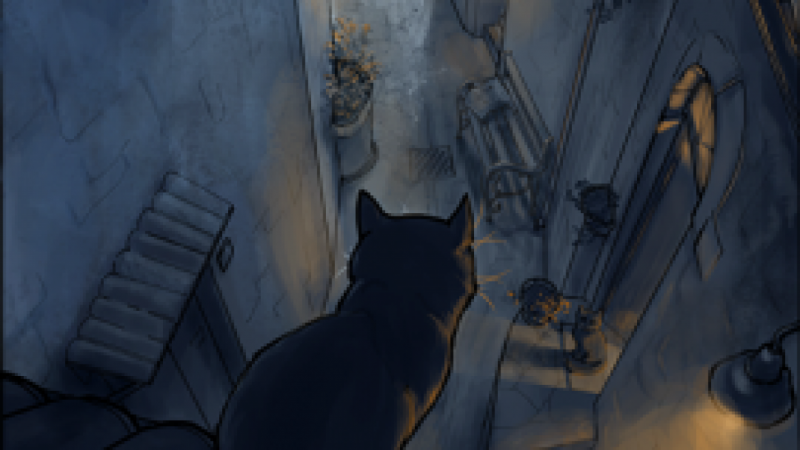 Introduction: The basic setup and terminology used for all forms of perspective, and will be used throughout the class and your art from hereon after. One-Point Perspective: The most basic form of perspective, with one vanishing point. 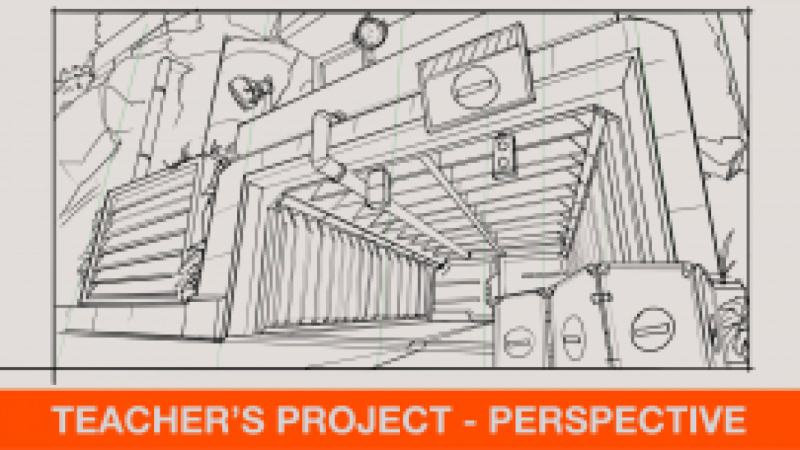 We cover drawing perspective, including what to consider when you do. Two-Point Perspective: How placing a second vanishing point changes the construction of your scene and how the world is transformed around you with new dimensionality. Three-Point Perspective: How placing a third vanishing point further changes the construction of your scene and how to think differently about the spatial relationships of the vanishing points to create believable 3D space. Atmospheric Perspective: Used in conjunction with other perspectives, we cover how atmosphere and color can increase the illusion of depth in your images. We also cover alternative perspective techniques to consider when just drawing or coloring a picture. Additional Considerations: We cover drawing shapes and objects in 3D, such as circles, cylinders, and successive objects, such as stairs. We also take a look at foreshortening! Adding Details that Matter: Make your scene believable! Consistency! Objects, Objects, Objects! Atmosphere! People that are actually standing firmly on the ground! How to build your scene from seemingly nothing! I share my best drawing tips, and address how much detail is necessary. Then you can make consistent progress in your drawings, rather than getting lost on tiny, meaningless details. Your project! Where to find inspiration for your drawing. Considering which perspective to use, and best ways to start working. 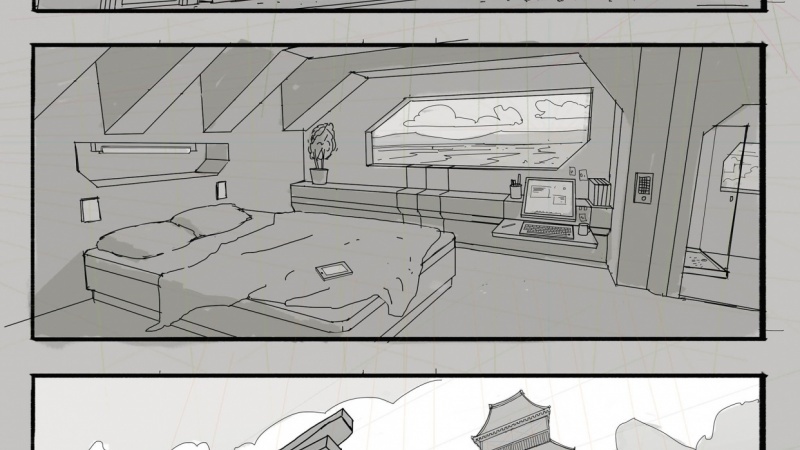 Above: Scenery development sketches of mine in two and three-point perspective. 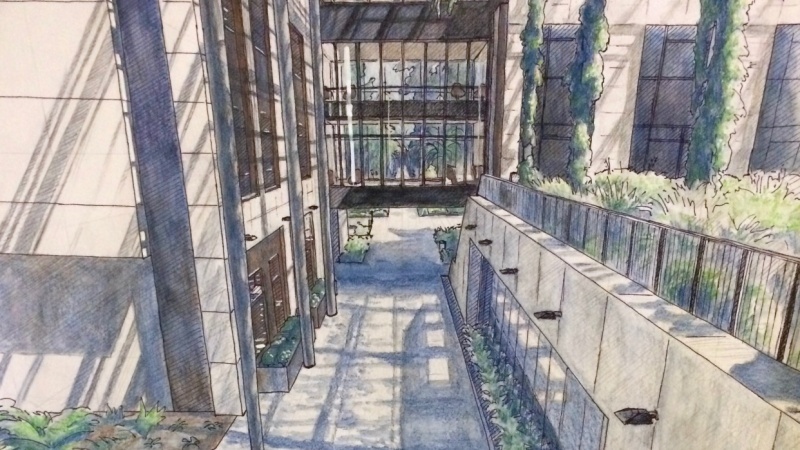 You will create a perspective drawing based upon your interest and subject matter. This can be an indoor/outdoor scene, urban/suburban environment, preferrably something man made. The class is set up where you will be encouraged to begin practicing perspective drawing (at least one drawing in One, Two and Three point perspective,) then once you've done a sketch that you feel strongly about, you'll be encourage to develop that drawing in a more finished full environment! The overall goal of the class is to have you demonstrate an improved understanding and implementation of perspective in your art, and hopefully how you see the world around you. 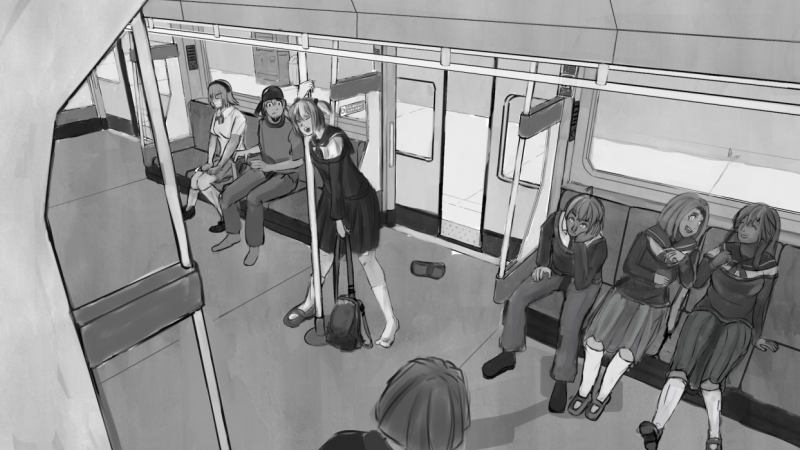 However, there is an element of environment design in this class as well, since perspective inherently lends itself to drawing realistic spaces. While your project may just start off as a bunch of boxes in perspective, my teachings and the feedback of your peers will certainly encourage you to push yourself to develop your drawings to the next level and produce full scene environments. The information I provide will be crucial to helping you create an environment drawing quicker than you ever thought possible! It's not as daunting as you might think! The foundation is the most important part of your drawing, so you will be encouraged to share your progress and any other practice drawings along the way to your finished work. And most of all, I hope you'll enjoy yourself in exploring your new passion for perspective drawing! Above: Pure perspective-liciousness. And soon, you can too! In this class, you need very little prior drawing knowledge to participate. Perspective is a fundamental aspect of illustration, so if you're just starting out, or are adept but never got around to building these skills, you've come to the right place to learn! This class can be drawn with whatever mediums you're most comfortable with. Pencil/pen, ruler on paper, or Photoshop with a graphic tablet -- it's all up to you! The most important aspect of this class is that you show an improved understanding of how perspective works, even if that means drawing only boxes accurately in 3D space. I definitely want to challenge you, though. So I do encourage you to attempt drawing a type of environment as a final project to really put your skills to the test. That said, this class focuses more on the aspect of how we observe perspective in our environments and NOT on people. This course is not about anatomy or character design. It's about understanding the space around you and how to represent it two-dimensionally on paper! Come on in and enjoy yourself! I want to see you get better just as much as you want to yourself. Create an illustration of an environment in full perspective! My name is Matt Laskowski, I'm a professional illustrator and designer living in Boston, MA. I went to the Art Institute of Boston (AIB) from 2005-2009 studying digital media in illustration.